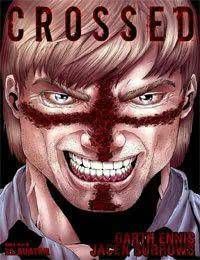 Garth Ennis has pulled out all the stops to write the most twisted book of his career, Crossed! Through ten heart-stopping chapters, Crossed is his horrifically visceral exploration of the pure evil that humans are truly capable of indulging. This gut-wrenching vision is brought to vivid - and more than a little disturbing - life by his partner-in-crime, Jacen Burrows. Imagine, for a moment, the worst crimes against humanity. Picture the cruelest affronts to decency. Conjure your darkest nightmares - and then realize it could all be so much worse. When civilization crumbles in one terrifying moment, when people are gleefully breaking into unthinkable acts of violence all around you, when everyone you love has died screaming in agony - What do you do? There is no help. There is no hope. There is no escape. There are only the Crossed.